Do you ever wear matching clothing? Complete track suits? Do you wish for Adult Garanimals with coded tags that help you decide if your top and your bottom clothing choices coordinate? It's not very usual for me to have all the foods matchy-matchy on the plate. [Heck, the plates don't even match each other.] Apparently I tend to get all matchy-matchy with Swai. 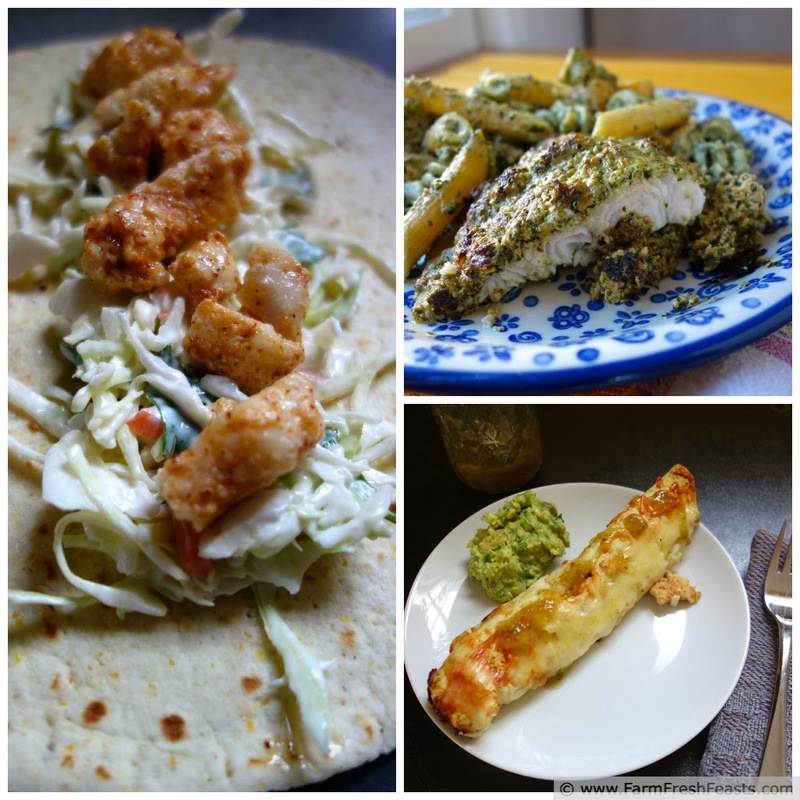 Like I said the first time I posted a Swai recipe, "Swai is a white fleshed fish in the "Good Alternative" category on the Monterey Bay Aquarium Seafood Watch website. Protein that is a Good Alternative, that is a great price, is good for me." That remains true today. In addition to the beef in the freezer (link to my beef recipe round up featuring 106 recipes from 66 bloggers) and the wild sockeye salmon from Seldovia Point, AK, the fish we eat the most is Swai. It's useful in a variety of preparations, I've shared some related links below. We often like to eat fish with rice, so I wanted to try an Asian preparation for this Swai. 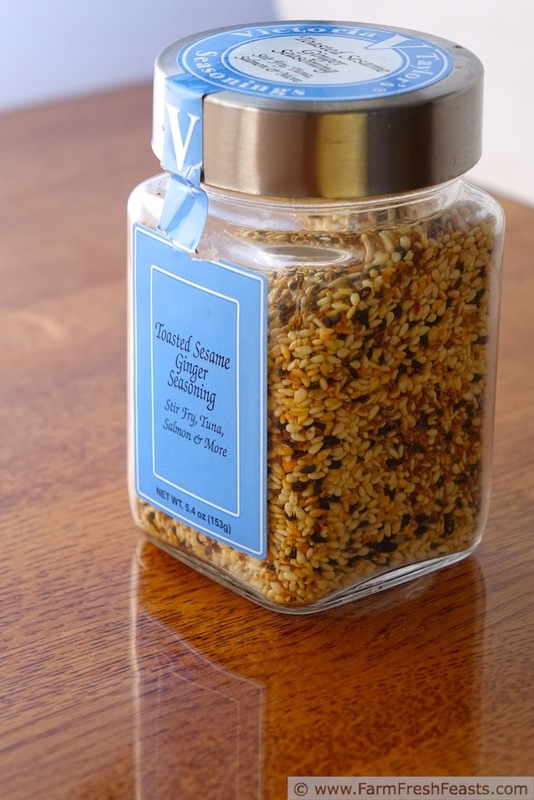 I picked up this sesame seed blend at a TJMaxx/Marshall's, taking a page from Heather's shopping tips, and thought it would be good rolled around inside out sushi as a coating for fish. From there the idea of coating the fish in hoisin sauce was a no-brainer. Since I also had radishes from the Community Supported Agriculture (CSA) farm share to play with, I opted to give them a similar coating and see how it played in Peoria the dining room. The result was surprisingly good. Roasting brings out the sweetness from the radishes and the hoisin provides them with a nice tang. 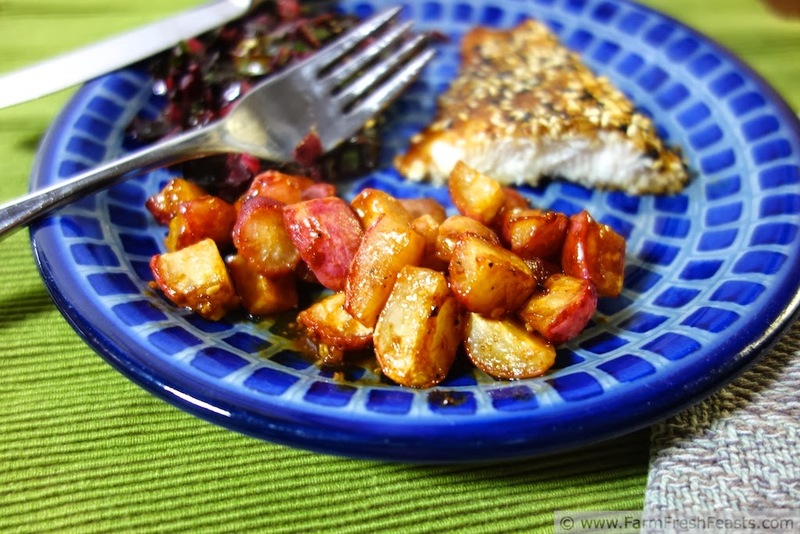 We all enjoyed this meal, and to get the entire family to enjoy radishes is an accomplishment worthy of a Week In Review post. On the plate you'll also see beet greens. Specifically, Asian Beet Greens. This bonus recipe is up on my FB page and my G+ page if you'd like to check it out. I make this meal simultaneously--that is, since the radishes take a bit longer than the Swai I prep them while the oven is preheating, then toss the radishes in the oven and prep the Swai. 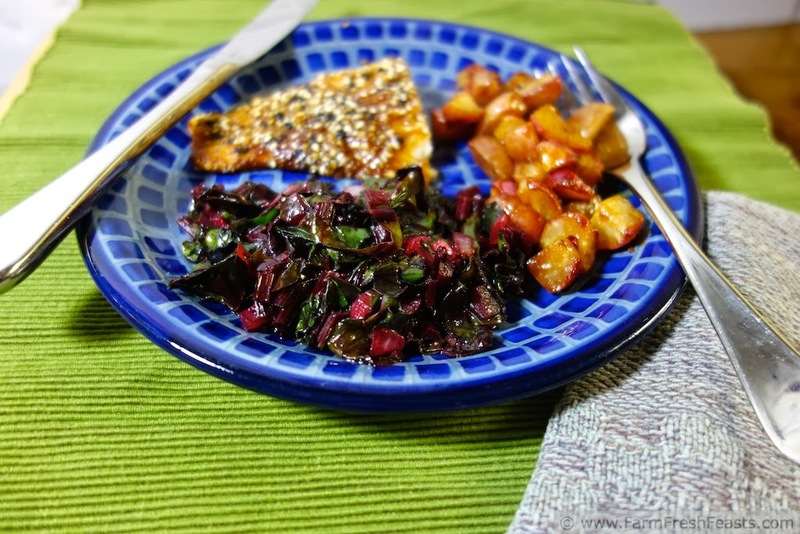 I add it to the oven, then turn to the stovetop and make the Asian beet greens, pausing to toss the radishes with hoisin sauce as written below. That way everything is done at the same time, with slightly less coordination required to assemble a decent outfit. Preheat the oven to 400 degrees Fahrenheit. For easy clean up, lay a sheet of parchment paper on a rimmed baking sheet. In a large bowl, toss the radishes with oil and season with salt and pepper. Spread out on a rimmed baking sheet and roast for 20 minutes. Return radishes to bowl and toss with hoisin sauce. Roast for 10 more minutes until the radishes are soft and glazed with sauce. Serve. Place fillets on baking sheet. 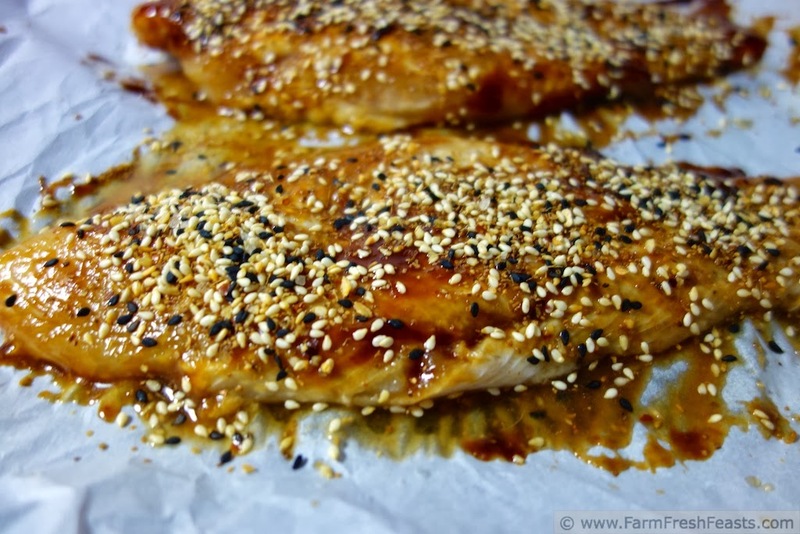 Brush fillet with hoisin sauce and sprinkle on sesame ginger seasoning. Flip the fillet over and repeat on the other side. Bake for 20 to 25 minutes until fish flakes easily with a fork and is opaque. I think I saw it in Virginia, but I never bought it until I saw it on sale $1.99/pound here in Ohio. The family likes it, so we're alternating between wild sockeye salmon and swai and that's working out well. I'm interested to try my home canned tomatoes in Alanna's Lazy Man's Cioppino so I may branch out to some other seafood choices, too. I'm not much of a fish girl despite the Hubby's attempts to get me to try more fish. I know it's great for me from a health perspective; I always get hung up on the texture though. It's not my bag, but radishes certainly are and fish is definitely on the Hubby's menu so this is another meal that will likely push me outside my comfort zone and I'll end up thrilled with the results. I like that you push me to test my food boundaries, and I haven't been disappointed yet. In fact, I'm delighted with my ever expanding food horizons. Not too shabby for a girl's who's food couldn't touch ten years ago. I've expanded my food horizons a good bit--but I can't handle canned salmon because of the texture. I like it raw, smoked, and baked/grilled. But canned? That's for tuna, only. I don't like many sweet and savory things to touch (like my salsa is nowhere near my pancakes when I'm having a giant breakfast). My kiddos love fish, but we've never heard of swai before. This looks super yummy. Thanks for sharing at Simple Supper Tuesday. My kids have loved fish sticks and I'm glad to enlarge their repertoire in ways that they enjoy. Thanks for hosting!